Ice Flow is the second level of World 4 in Paper Mario: Sticker Star. This level has two long frozen rivers with Cooligans sliding down each river. Hitting a Cooligan will knock the player back a short distance, and it causes the player to take damage. Coins also slide down every once in a while. Ice Flow has two very long frozen rivers, with a cave with a mountain climb inside following the first river, and a mountain with the Comet Piece. On the first river, collecting 100 coins (from the coins that slide down) causes a Big 1-UP sticker to slide down. On the second river, collecting another 100 coins gives a Big Shiny 1-UP sticker. The player can also find, on the mountain with the Comet Piece, a Secret Door Sticker. In order to get the sticker, Mario must reveal a series of hidden blocks on the cliff beside the Comet Piece. A random Thing not in the Album, sticker or not, appears on the second ice river. 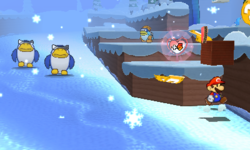 When the player is on the frozen rivers, the music changes to a remixed variation of the main snow theme. The Enigmansion, which stands as the next level, is visible in the background near the end of the level before the player collects the Comet Piece.